pushed forward to a vote by the full Senate this afternoon. Mr. LaHood, in other words, will be the Secretary of Transportation this afternoon. There is little surprising about the Committee’s easy response to him – he was a congressman for decades, and there are few people Senators and Representatives like more than their own colleagues. 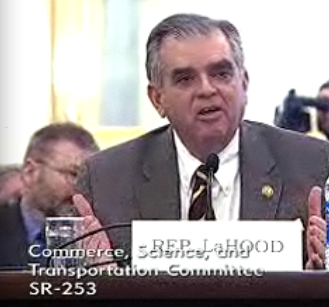 Mr. LaHood portrayed himself as a pusher of “new ideas” in transportation during questioning (some of which is transcribed at the bottom of the post). He argued that he would talk to as many different people as possible to get things done. He would work in a bipartisan manner, perhaps not a surprising statement coming from a Republican working in a Democratic administration. He didn’t say all too much about transit or rail, but certainly didn’t come across as an opponent of alternative transportation, either. He came across as reasonable, open, and not too heavily weighted towards highway funding. Obviously, it’s good to know that Mr. LaHood is going to pursue investments in intercity rail and mass transit. In such a short statement, little more than this could have been expected. He also talked a bit about the reauthorization of the Transportation Bill later this year, which he hoped would allow more flexibility in transportation dollars. That is, funds would be appropriated in the manner in which communities wish, rather than in a predetermined, one-size-fits-all way. This would be a meaningful and appropriate change to the current policy, which emphasized highways over pretty much everything else. However, there were no more specifics in his testimony, other than his repeated interest in working on a bipartisan basis. He stated that there are “no Republican or Democratic transportation issues,” a point with which recent history does not agree. But perhaps the end of the Bush administration means a change in the strigent anti-transit and anti-rail beliefs of Republicans? Some of the Senators did speak about reforming the Transportation Department’s decision-making based around important criteria. Senator Tom Udall (D-NM) argued that environmental considerations ought to take precedent. Mr. Rockefeller’s testimony points to the fact that the Senate Committee will focus on using transportation as a way to improve the environment. This would necessarily mean a focus on rail and transit systems, which are by definition more environmentally friendly than automobile-based transportation. Senator Jim DeMint (R-SC) expressed excitement about the prospect of having an intercity rail system as the Department of Transportation’s next long-term project. Mr. DeMint pointed out that such a network could be effective congestion-reliever and alternative to air travel. Senator Amy Klobuchar (D-MN) mentioned the importance of mass transit and railroads, arguing for the improved financing of Amtrak and the improved regulation of freight railroads. There were a few interesting questions posed to Mr. LaHood. Mr. LaHood: “Amtrak bill is a very good bill… I want to implement the bill effectively… the system is a lifeblood for many of the country’s communities.” Mr. LaHood also argued against tolling existing roadways in response to another question from Ms. Hutchison, but argued that new bridges and the like could be tolled. I just wanted to thank you for your excellent coverage of this hearing – it makes me feel somewhat better about this appointment.